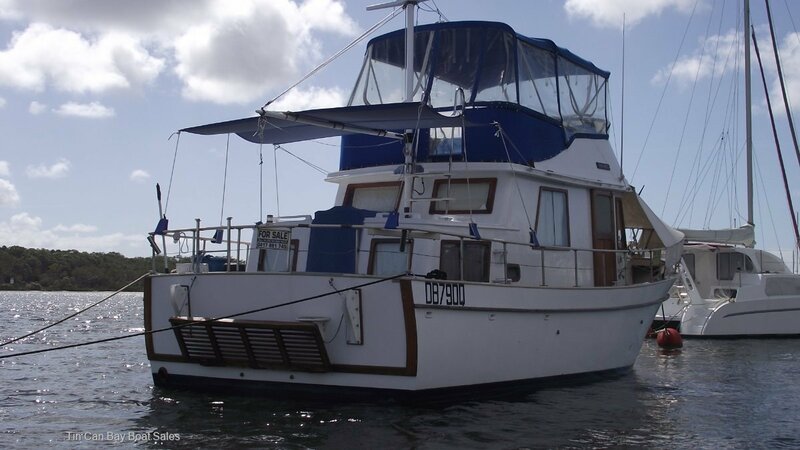 Well maintained and presented Clipper 34 Fly Bridge cruiser for sale. Amadeus has an excellent layout, has fore and aft cabins with separate heads, a functional galley, large saloon table and walk-around decks. The spacious flybridge station alows for easy navigation in shoal water or coming up to anchor. Current owner has maintained the boat in good condition, with new engine beds, new stern tube, rebuilt motor (2011) and good gneral upkeep. Clipper 34's are popular bay cruisers, have the space to be comfortable and are economical when underway with a slow revving, reliable Ford 120 hp diesel. They are also offshore capable. One of the best Clipper 34's I have seen for its age, in some time. Deck Material: Marine ply, GRP, teak decks in good order. 2 start batteries 3 1/2 years old. Remarks: Neat and tidy Clipper 34. The low draft and good visibility from either steering station, make Amadeus an ideal bay cruiser for the Sandy Straits.